A memo from Gordon Cole dated August 4, 2016, a 1969 postcard from Norma, a 1947 physician’s intake exam of a patient called… Margaret Coulson! The world of Twin Peaks just expanded a little thanks to this brand new teaser for Mark Frost’s upcoming novel. Roll up your sleeves and get to work on this thing —time is of the essence— and get back to me with your findings ASAP. We have a lot to discuss, folks! What have you spotted? Pre-order The Secret History of Twin Peaks (Amazon/Book Depository). And check this previous post for more information regarding the contents of the book. UPDATE: Here are the dates and locations for Mark Frost’s North American book tour. More events to be added as they are booked. NYC on October 20th at the Barnes & Noble, Union Square. MINNEAPOLIS on October 22th at Magers & Quinn. LOS ANGELES on October 24th at The Last Bookstore. SAN FRANCISCO on October 25th at The Booksmith (at the Roxie Theater). PORTLAND on October 27th at Powell’s Burnside. SEATTLE on October 29th at Elliott Bay Book Company. 1. Shame about the date being 2016. Was really hoping for 2014. Oh well. 2. If Norma’s parents’ last name is Lindstrom, where does Blackburn come in? 3. The Log Lady’s maiden name appears to be Coulson, which is nice. But that tattoo is actually Major Briggs’ tattoo, NOT Margaret’s. I think the “see you again in 25 years” is really between Laura (or her double/MFAP’s “cousin”) and Cooper. The show– and especially this book, which is a dossier of material no doubt collected over an extensive amount of time– may very well be set in a different year. I personally have never seen that 25 years as referring to the air dates of the shows. 2. Half-sisters perhaps? Annie seems a fair bit younger than Norma so it makes sense that they would have different fathers right? Erik, you really need to get a grip. Looks like Cooper is no longer working for the FBI. Or, at least, no longer working under Gordon. But … yeah, it will be interesting to see what happened to Dale. At 0:21 on the left page, i can’t read the name before Bob, is that Denver? Denver Bob? And who is T_____ P______? 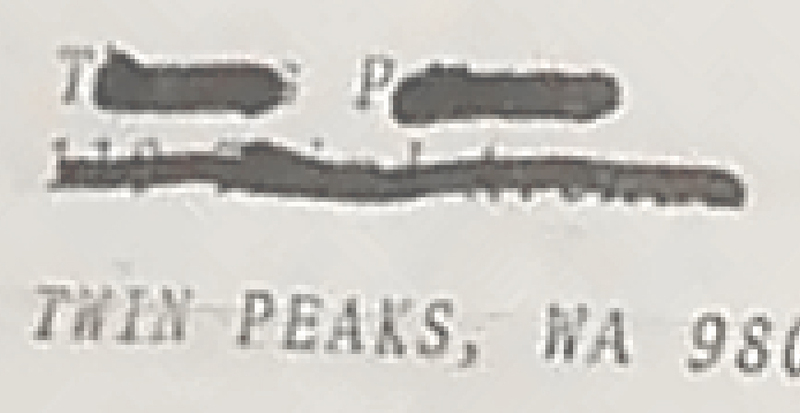 It can’t be Twin Peaks, it’s looks like a name. I suppose the UFO report are from the bluebook project but what’s the connection with Douglas Milford, the mayor’s brother? Ok, i want that book. Looks like T_____s. Thomas? Palmer? It ends with “s” so it cant be Tremond! The Access Guide map has three roads which start with S: Snow Street; Sparkwood; and Steeplejack Road. there is a hair in the coffee….? Probably not an important clue, but also probably intentional. I saw that, too. i didn’t see a hair, and i watched several times, but i saw coffee grounds floating. Here’s hoping you can reach out to Mark Frost and make sure they modify that symbol for the Log Lady’s tattoo. They’ve got it mixed with Major Briggs. Kinda important that it be fixed before the book ships to the printer. If not, there can either be a work-around explanation, or (assuming it is a mistake and not something intentional) a subsequent acknowledgement or errata. The book is already printed. If anything is mixed up its been done intentionally. The tattoo was actually a burn mark so it would fade and could be in different places. Too late – copies of the book have already been circulated. Do you think that last document about agent cooper is out first introduction to the main character in the new twin peaks? I think it is. and, again, the name is hidden. I thought it might be, but I also thought that might be intended to draw you, the viewer/reader, in as though YOU are the agent on the case. Actually, how cool would it be if the whole show was filmed as though it was a first person experience? I have one doub; as said before, the tatoo which appears in the paper is the one that Major Briggs had, not the one Lady Log had, but rewatching the document, Catherine only was 7 years. In the series, she said that her tatoo (the jagged one) appeared the night her husband died, much after she was 7. So, o you think it might be possible that se had this one (the “radioactive” one) and then it dissapeared? I just re watch the episode, she say she was 7 years old. Probably best not to hope for perfect continuity between the original show and this one. I love this trailer. Whomever did the work on the ephemera did an incredible job!!! Snoqualmie’s zip code on the package’s return address (ha). The “real” TP zip code would be 99153 or 99157. Gordon Cole’s been promoted to Deputy Director. Congrats. Yeah, that’s not coffee. Surface tension is too high. Either it’s not coffee or it’s about a month old (ew). So that’s how he gets all the babes. Dude paid cash. That was a lot of lettuce in 1947. Poor Margaret/Maggie. (Born in 1933, so ~57 when we meet her in Season One. Hm. Thought she was younger.) More on her’s and Garland Briggs’ tattooes. Dougie again. He, like many people, voluntarily enlisted in the military the day after Pearl Harbor at age 32. (In Season Two, he is 81.) Air Force? Planes? More UFOs??? The Milfords are Roman Catholic. (That explains the loud fighting <<<JOKE, PEOPLE.) Living in San Francisco at the time. Lists no next of kin, so this is after the split from Dwayne/family. No tattoos. THE log. What's up with all the moss? Has it been hidden/lost outdoors? Margaret’s date of birth is 1940, according to the report – the report itself is dated “1947”. typo i think. in gordon’s letter. supposed to be northeast washington, not northwest. I read somewhere that there’s a hint in the video that Cooper is still missing, like Agent Jeffries back then. Is there any proof I missed? I need an exact source for my bachelor thesis. The memo from Gordon Cole at the very end implies that Cooper is no longer around, hence his files are being given to another FBI Agent. So.. If I understood correctly… there was a crime on July 7, the police found the “enclosed dossier” and called FBI because Gordon’s name is written. There is a future date (aug 3) on the box. The FBI opens and investigates. Weeks later, on the next day of the box’s date (aug 4) Gordon send its contents to someone (a new agent) to learn who gathered that material and why someone was sending it to T– P— using Gordon’s name. Not necessarily. The letter from Cole (the “interoffice memorandum”) could have been e-mailed or faxed on August 4th, separately from the package, on the date when the package would reach the recipient (Agent “TP”). What if they are talking about the events that occurred when Margaret was seven? And what if she has the same tattoo Major Briggs has but they never disclosed it to viewers until now? This is exactly what I’m thinking. Everyone says, “Oh, it’s not the tattoo we’ve seen on her previously” and they point out the continuity error… but what if it’s simply a different marking? The log looks like the mask of the jumping man. The heyoka. Pinocchio. Any clue what the sound is that’s playing through the video. At first I thought is may be a circular saw, but it gets too shrill I think. It’s broken at the end by the sound of (I think) a copy machine. To me, it’s the sound of one of Dale Cooper’s audio tapes rewinding. at first glance, i don’t really like the idea of diane being in the town of twin peaks. i always liked that we never really saw her. given that however, laura dern would be old enough for that part, and of course laura dern is always good no matter what she does, so if there has to be a diane, she would be a good choice. i, too, was hoping for two coopers…that would be a great double dose both of cooper and of kyle maclachlan. agreed about sheryl lee too…i am imagining at the very least two roles for her, which is also great! She doesn’t necessarily have to be in the town. Maybe maybe not. She could be in Philadelphia. Might be the largest cast ever so I’m not sure how much screen time each can get anyway so who knows if Diane even gets a large role. yes, you’re right, my bad…i was somehow blending your thoughts with another post that speculated that not only would laura dern be diane, but that diane would also be the main f.b.i. presence in the series. i always had imagined if they ever showed diane, that she would be kind of like the character of “sam”, the secretary in the old sixties private eye show, “richard diamond”‘ where all you ever saw of her was her legs and heard her voice. yes, the cast is huge, and has a lot of new performers to the series who i am looking forward to seeing in the lynch/frost universe, like one of my favorite actresses, candy clark, for instance. but i am hoping i don’t fall into “cameo spotting” at my own own expense. thanks for the clarification. cheers! Completely agree with you. Maybe would be nice if she was still a mystery but I read part of the reason they are doing this is to solve the mystery. Now they get a chance to end the series, really end it. How it turns out is beyond me. Here’s hoping to a Spring not summer release. Are they splitting the 18 episodes into 2 seasons? yes i think i heard or read an interveiw w/ mark frost where he said viewers would be more satisfied with the resolution in the new series. considering that the way they “resolved” mysteries in the nineties’ series always resulted in opening up an even bigger mystery, this could mean a real resolution to some of the bigger questions about the storyline. it doesn’t matter so much to me though, i have a lot of admiration ( as probably all the people here do) for both frost and lynch, as writers and filmmakers, and i have never been bothered by open-ended storylines. i kind of enjoy having those loose ends to ponder. 18 episodes is the rumour i have heard, so i will be surprised if showtime doesn’t try to pull at least 2 seasons out of it.